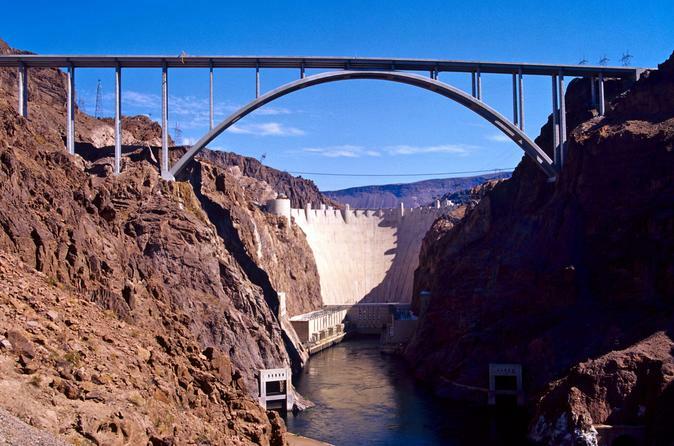 Your Hoover Dam tour travels from Las Vegas, through Henderson - second largest city in Nevada, historic Boulder City, past the picturesque Lake Mead, then over the top of Hoover Dam to the Arizona Lookout. Your professional tour guide will provide full narration of this six hour adventure as you travel through the colorful natural side of the Las Vegas Valley. Enjoy spectacular views of scenic Lake Mead, the awe inspiring Mike O'Callahan/Pat Tillman Memorial Bridge (Bypass Bridge) and the entire Hoover Dam complex. This exciting tour commences with complimentary hotel pickup. As you make your way to the Hoover Dam, you will drive through historic Boulder City, home of the Hoover Dam construction workers in the early 1930's. You will also travel past Lake Mead, the second largest man-made lake in the Western Hemisphere, before crossing over the top of the Dam with closeup views of the architecture, penstocks and Arizona Spillway. A rest stop is taken at the Arizona Lookout with spectacular views of the entire Dam area including the Bypass Bridge. This includes a 15-20 minute rest stop and shopping opportunity. Following this, your tour guide will transport you to the Hoover Dam Visitors Center for entry to the Power Plant Tour. When the Hoover Dam was completed early in 1935, it was both the world's largest electric power producing facility and the world's largest concrete structure, weighing a total of 6.6 million tons. You will discover a multitude of facts on your tour about this impressive structure. The Bypass Bridge opened in 2010 stretching nearing 2,000 feet long and 840 feet above the Colorado River, making it the second highest bridge in the United States. Ample time is provided for souvenir shopping and purchase of food items at the Dam restaurant. This is truly an exciting and very educational experience that will provide you with a thorough overview of this fascinating, 80 year old, civil engineering wonder of the world.